Seeing is believing when it comes to our truly no-kill approach to animal welfare. Browse our video library and press releases below to see why we’re able to make such an impact — and how you can too! As the only open admission, truly no-kill animal shelter in Indiana, we do things a little differently. A lot, actually. Learn about our mission, how we further it, and what you can do to help. We’ve been out of space in our current facility for nearly a decade operating with significant spacial and operational challenges such as no intake/arrival area designed for cats, a quarantine area, a recovery area for the injured, a surgical suite, or outside space for the dogs to exercise to name a few. The fact we’ve evolved into one of the country’s few open-admission, truly No-Kill shelters is absolutely remarkable and a testament to our staff, board, and volunteers’ relentless support of our mission. It’s a testament to you. Words alone cannot do justice to the sense of urgency we have in building a better future. Please watch and see for yourself. Grab a box of Kleenex and settle in for the best HSHC rescue stories of 2018. This video compilation showcases our favorite memories, big saves, and touching adoptions of the year and was originally aired at Tinsel & Tails 2018. Want to walk down memory lane? See our 2017 video here. The breed may have a bad rap, but we’re working to change the reputation of Pit Bull Terriers (and mixes) one dog at a time. Working with us are the many dedicated owners and fosters (we call them Pit Bull Angels) who love and advocate for the bully breeds. See what real owners of pit bulls have to say about why they love the breed — and why you should consider adding one of these big-grinning, big-hearted pooches to your family. There aren’t always win-win solutions to problems, but Pets Healing Vets is certainly one of them. This innovative program pairs veterans with TBI and/or PTSD with rescue dogs who are specially suited to comfort them and help them reintegrate into civilian life. Learn more about Pets Healing Vets. See the impact on our veterans in our featured stories of 2018. But, at HSHC, we saw potential where no one else did. See the amazing stories of how these dogs are now serving and protecting innocent lives around the world! Canines, Felines and Wine–Divine – AND MORE! NOBLESVILLE, Ind. – The Humane Society for Hamilton County will be holding the 11th Annual Wine, Wags & Whiskers on Saturday, May 11, 2019, at a new location – The Embassy Suites in Noblesville. This new venue offers a larger space where all wine tasting festivities will take place in one room! The evening features delicious hors d’oeuvres, the wine tasting of your dreams, tempting sweets from Taylor’s Bakery, a silent auction with over 100 unique items (and a few trips of a lifetime), “pawsome” jewelry from Hupp Jewelers, and equally tempting adoptable animals who’ll steal your heart. American Jazz harpist, Jan Aldridge-Clark, will be performing her unique stylings of Swing, Bossa Nova, Blues, Gypsy Jazz and Pop while guests sample dozens of wines that will be available for purchase at an exclusive discount for attendees only – thanks to Crown Liquors. Admission tickets are $85 in advance and $95 at the door. This year, Wine, Wags & Whiskers is also offering a Mother’s Day Package for those looking to treat their mom to a night of wine and pets – not to mention you’ll be her new favorite! The Mother’s Day Package is $200 and comes with 2 admission tickets, 2 complimentary bottles of wine, and a beautiful rose corsage. Visit www.WineWagsandWhiskers.com for more information and to purchase tickets. Attendees must be 21 or older for admission. Wine, Wags & Whiskers is presented by Crown Liquors, Lola Plymale, VCA Animal Hospitals, Curran Architecture, Embassy Suites Noblesville, and Harding Poorman. Corporate sponsors include Southern Glazer’s Wine & Spirits, Shrout Family Chiropractic, Hupp Jewelers, Taylor’s Bakery, 92.3 WTTS and The Current. The mission of the Humane Society for Hamilton County is “Saving Lives. Educating Communities. Completing Families.” HSHC serves as both the animal control facility and Humane Society for Hamilton County, and as such, receives partial funding (approximately 20%) from Hamilton County. The majority of HSHC’s operation is funded by individual donations. HSHC is one of the few open-admission, truly “No-Kill” organizations in the United States in that it does not euthanize animals for time, space, treatable injuries, illnesses or rehabilitatable behavior issues regardless of age, breed, disability or special needs. HSHC also serves the community with a variety of unique programs like the Survivor Program and Pets Healing Vets (www.PetsHealingVets.com). The Humane Society for Hamilton County (HSHC) is a non-profit 501(c)(3) charitable organization. It is not a United Way Agency and is not affiliated with any other animal welfare group in the United States. NOBLESVILLE, Ind. -The kennels at the Humane Society for Hamilton County (HSHC) are full, with more dogs in need of shelter and life-saving care coming in every day. 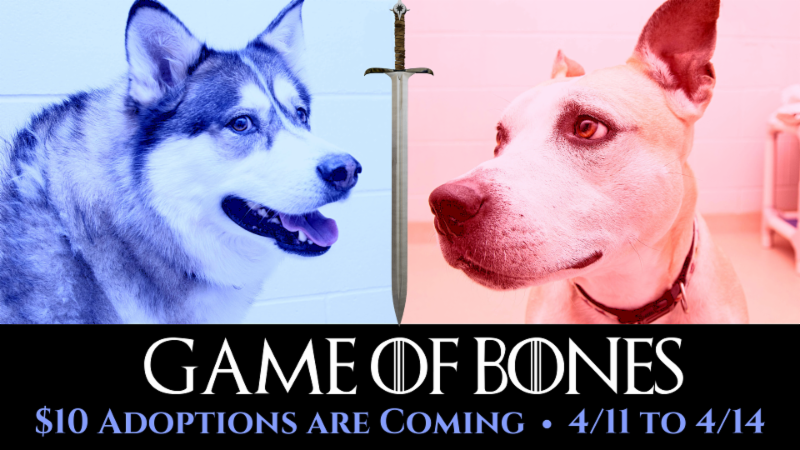 In the Game of Bones, all dogs must find their forever home – their adoption fees from April 11, 2019 – April 14, 2019 are only $10! Discounted adoption fees include: Spay/neuter, at least one round of vaccines, a microchip, food, a free wellness exam with a participating veterinarian and multiple discounts on pet services from training and boarding to invisible fencing. HSHC’s President and CEO will be at the Humane Society for Hamilton County on Thanksgiving Day from 4PM to 6PM offering media a tour of the shelter and preview of animals waiting to “Fill Your Heart, Not Your Cart” on Friday. Contact Rebecca Stevens at 317-710-7500. NOBLESVILLE, Ind. -The Humane Society for Hamilton County (HSHC) is calling for the community to fill their hearts, not their carts, this Black Friday. The shelter will be offering $5.00 adoptions* for adult pets and just $20.00 for kittens on Friday, November 23, 2018, from 9 a.m. to 5 p.m. *Some exclusions may apply. Humane Society Sets Goal to Raise $70,000 in 30 Days! NOBLESVILLE, Ind. – The Humane Society for Hamilton County (HSHC) kicked off its 2018 Annual Matching Campaign on Thursday, November 1, 2018, with $35,000 in pledges waiting to match donations dollar for dollar during the month of November. Donations made to the campaign between November 1-30 will have double the impact. $50 becomes $100, $100 becomes $200, $500 becomes $1000…with an opportunity to raise $70,000 in just 30 days. HSHC depends on donations to fund the daily operation and all life-saving medical care for more than 3,100 animals each year. To donate to their Annual Matching Campaign, go to: https://p2p.onecause.com/2018hshcmatch. NOBLESVILLE, Ind. – The 10th Annual Woofstock Charity Walk will kick off the Woofstock Festival on Saturday, October 6th, 2018 at 11:30 a.m.(Registration Begins at 10:30 am) at the Nickel Plate District Amphitheater. This year, our need for support is greater than ever. The number of animals needing our help is steadily increasing due to the amount of seniors surrendered, neglect, and major injury cases we have seen. Tuesday, local animal control officers brought 19 animals from a hoarding/neglect case to our shelter. These dogs and cats required extensive care … care only available thanks to the Survivor Program. The Survivor Program provides life-saving and emergency care to thousands of animals each year. This program is fully funded through donations from our generous donors and community. Without their support, we would be unable to provide much of the life-saving care we do. It is critical for the community and public to support this program and participate in the Survivor Walk. Leading up to the event, individuals, groups, and organizations create teams at https://woofstocksurvivorwalk.greatfeats.com to organize fundraising efforts. The fundraising link can easily be shared through email or social media to receive donations and support your fundraising team. Top youth, individual, corporate, and team fundraisers will be awarded different prizes ranging from Three Dog Bakery gift cards to spa packages and a Jump ‘n’ Play party for the top youth fundraiser. There are two options for those interested in participating: fundraisers can walk and fundraise, or not walk and still fundraise! The walk begins at 11:30 a.m. and is dog and family friendly! NOBLESVILLE, Ind. – The Humane Society for Hamilton County (HSHC) has been awarded a $25,000 grant from the Nina Mason Pulliam Charitable Trust for their efforts in saving animals from Marion County who are the hardest-to-save and place. The grant will be used to fund the life-saving care for animals transferred to the Humane Society for Hamilton County from Indianapolis Animal Care Services, as well as animals accepted directly from Marion County residents–the majority of which are in need of medical care for life threatening injuries and illnesses resulting from abuse, neglect, being hit by a car or simply senior animals in need of special care. The Humane Society for Hamilton County is hosting their largest fundraiser of the year to support the Survivor Program on Saturday, October 6th–the 10th Annual Woofstock Survivor Charity Walk. To learn more about the walk and how you can support HSHC’s Survivor Program, go to: https://woofstocksurvivorwalk.greatfeats.com. NOBLESVILLE, IND. Old dogs have something to wag about this summer, as The Grey Muzzle Organization announces the recipients of its annual grants, and dogs at the Humane Society for Hamilton County are among the winners. HSHC is one of 66 animal welfare groups in 30 states who were chosen from more than 300 applicants to receive a grant to help local senior dogs. NOBLESVILLE, Ind. – The Humane Society for Hamilton County will be holding the 6th Annual Ruff Ride & VIP Nite at the new, state of the art Harley Davidson of Indianapolis store in Fishers on June 22-23, 2018, with net proceeds benefiting their Pets Healing Vets Program. VIP Nite kicks off the Ruff Ride weekend on Friday, June 22, from 6:00 p.m. – 9:00 p.m. and is open to both non-riders and those participating in the Ruff Ride on Saturday. The event will give guests the chance to experience the new Harley Davidson facility and meet veterans in our program and their support pets. Appetizers will be provided by Sullivan’s Steakhouse along with complimentary wine and beer from Monarch Beverage and Sun King, a silent auction, and adoptable dogs. Comedic group, The Electric Amish, also known as the the “men in black – and white,” will be performing their greatest hits. The Ruff Ride is Saturday, June 23, with registration and lunch from 11:00 a.m. – 1:00 p.m. The police escorted ride starts at 1:00 p.m. on following a scenic route through Hamilton County. Following the ride, attendees will have an all access pass to the after party featuring live music from Groove Smash, dessert, and more! The Ruff Ride and VIP Nite supports Pets Healing Vets, a program fully funded and facilitated by the Humane Society for Hamilton County. Pets Healing Vets pairs Hoosier Veterans suffering from post traumatic stress disorder and/or traumatic brain injury with emotional support animals. There are currently over 25 veterans and their pets in the program. Combo tickets to VIP Nite and The Ruff Ride are $60. VIP Nite tickets only are $45 in advance and $55 at the door (if not sold out). Tickets for the Ruff Ride are $40/rider in advance and $45 day of the ride. Visit www.TheRuffRide.com for more information and to purchase tickets. VIP Nite attendees must be 21 or older for admission. The Ruff Ride and VIP Nite is presented by Harley Davidson of Indianapolis, Kahlo Chrysler Dodge Jeep Ram, Noah’s Animal Hospitals, and Q95. Community sponsors include Monarch Beverage, Sun king Brewing, Sullivan’s Steakhouse, Paws & Play, City of Fishers, the City of Carmel, Discount Tire, and the Yokota Foundation. The mission of the Humane Society for Hamilton County is “Saving Lives. Educating Communities. Completing Families.” HSHC serves as both the animal control facility and Humane Society for Hamilton County, and as such, receives partial funding (approximately 20%) from Hamilton County. The majority of HSHC’s operation is funded by individual donations. HSHC is one of the few open-admission, truly “No-Kill” organizations in the United States in that it does not euthanize animals for time, space, treatable injuries, illnesses or rehabilitatable behavior issues regardless of age, breed, disability or special needs. HSHC also serves the community with a variety of unique programs like the Survivor Program and Pets Healing Vets (www.PetsHealingVets.com ). The Humane Society for Hamilton County (HSHC) is a non-profit 501(c)(3) charitable organization. It is not a United Way Agency and is not affiliated with any other animal welfare group in the United States. NOBLESVILLE, Ind. – The Humane Society for Hamilton County will be holding the 10th Annual Wine, Wags & Whiskers on Friday, May 11, 2018, at the Renaissance Indianapolis North Hotel in Carmel. The evening features delicious hors d’oeuvres and tempting sweets, a silent auction with over 100 unique items, Kendra Scott Jewelry Pull and equally tempting adoptable animals who’ll steal your heart. American Jazz harpist, Jan Aldridge-Clark, will be performing her unique stylings of Swing, Bossa Nova, Blues, Gypsy Jazz and Pop while guests sample dozens of wines that will be available for purchase at an exclusive discount for attendees only. General admission tickets are $65 in advance and $75 at the door. VIP tickets are $85 in advance and $95 at the door (if available). Corporate Packages and VIP Tables seating 10 guests are available for $900 or $1,500 but are limited. Attendees must be 21 or older for admission. Visit www.WineWagsandWhiskers.com for more information and to purchase tickets. Wine, Wags & Whiskers is presented by Crown Liquors, VCA Animal Hospitals, Renaissance Indianapolis North Hotel, Harding Poorman, Paradigm Media, and Steaming Kettle Studio. The VIP Experience Lounge is sponsored by Curran Architecture, Southern Glazer’s Wine & Spirits, Shrout Family Chiropractic, and Tito’s Handmade Vodka. The mission of the Humane Society for Hamilton County is “Saving Lives. Educating Communities. Completing Families.” HSHC serves as both the animal control facility and Humane Society for Hamilton County, and as such, receives partial funding (approximately 22%) from Hamilton County. The majority of HSHC’s operation is funded by individual donations. HSHC is one of the few open-admission, truly “No-Kill” organizations in the United States in that it does not euthanize animals for time, space, treatable injuries, illnesses or rehabilitatable behavior issues regardless of age, breed, disability or special needs. HSHC also serves the community with a variety of unique programs like the Survivor Program and Pets Healing Vets (www.PetsHealingVets.com). The Humane Society for Hamilton County (HSHC) is a non-profit 501(c)(3) charitable organization. It is not a United Way Agency and is not affiliated with any other animal welfare group in the United States. NOBLESVILLE, Ind. – This Black Friday, give and receive the gift of love to one (or two) of over 300 pets in our care. The Humane Society for Hamilton County will be offering $5.00 adoptions* on Friday, November 24, 2017, from 10 a.m. to 5 p.m. The hope is people will considering filling their hearts and not their carts this Friday as hundreds of unwanted, neglected and abused pets wait for the only thing on their wish lists this holiday season–a home. The $5 adoption fee includes: spay/neuter, at least one round of vaccines, a microchip, food, a free wellness exam with a participating veterinarian and multiple discounts on pet services from training and boarding to invisible fencing. Families who adopt a pet on Friday will also have the chance to win a $100 Three Dog Bakery Gift Card. NOBLESVILLE, Ind. – The Humane Society for Hamilton County (HSHC) is excited to announce the grand opening of Trends for Tails Resale Boutique (formerly TattleTails). Trends for Tails is an upscale, donation based resale boutique located next to the Dollar General at 1109 S. 10th Street in Noblesville. The boutique features new and almost new women’s and men’s clothing, shoes, accessories, and home decor. The boutique is owned and operated by HSHC with 100% of net proceeds benefiting the shelter’s mission. Guest of honor Teri Ditslear will assist HSHC Executive Director, Rebecca Stevens, with the ribbon cutting at 10:00 a.m. The Grand Opening festivities start at noon and will run until 4:00 p.m. The opening features refreshments, adoptable dogs, giveaways throughout the day, up to 50% off select items, and styling tips from a former Saks Fifth Avenue Style Advisor. Hot chocolate will be provided by Culligan and Gigi’s Cupcakes will be on site to tickle your taste buds will delectable treats. The Humane Society for Hamilton County (HSHC) is very excited to announce the launch of the rebranding of their entire logo suite including a new corporate logo and tag line. Their branding still falls within the red, white and blue palette but with a cleaner, more updated look. “We enlisted the expertise of Creative Quarterback to help us update our logos and website so we could share our unique programs and life-saving philosophy through a more streamlined and cohesive branding strategy,” said Rebecca Stevens, Executive Director of the Humane Society. “We have evolved so much over the last decade serving our community as not only one of the few open-admission, truly no-kill shelters in the country, but also one that offers unique programs like Pets Healing Vets. We have added many events to our annual docket as well, each with a logo—so it was time to tie everything together with a more easily identified, singular color palette and theme. The shelter’s new tagline, “Love & Let Live,” speaks to HSHC’s no-kill philosophy of giving every adoptable animal who is savable, treatable or rehabilitatable a second chance at love and life. Ross and HSHC worked together to raise $16,105 utilized to fund the work of 11 freelancers who redesigned the shelter’s website, logo suite and marketing collateral, developed a new corporate video, and prepared all new templates for the shelter’s e-communication strategy and proposals. Creative Quarterback donated over $26,000 in services in addition to the funds raised to complete these projects. Pass it Forward is a creative win-win program that dramatically improves the marketing and online presence of animal welfare nonprofits through teamwork. Creative Quarterback is a 100% virtual marketing agency that drafts and manages teams of creative freelancers to give organizations without sufficient internal marketing resources access to big-boy creative talent and project management. The Humane Society for Hamilton County (HSHC) is a non-profit 501(c)(3) charitable organization. It is not a United Way Agency and is not affiliated with any other animal welfare group in the United States. The mission of the Humane Society for Hamilton County is “Saving Lives. Educating Communities. Completing Families.” HSHC serves as both the animal control facility and Humane Society for Hamilton County, and as such, receives partial funding (approximately 23%) from Hamilton County. The majority of HSHC’s operation is funded by individual donations. HSHC is one of the few open-admission, truly “No-Kill” organizations in the United States in that it does not euthanize animals for time, space, treatable injuries, illnesses or rehabilitatable behavior issues regardless of age, breed, disability or special needs. HSHC also serves the community with a variety of unique programs like the Survivor Program and Pets Healing Vets (www.PetsHealingVets.com).